Southern bluefin tuna are distributed only in the southern hemisphere, and mainly inhabit cold waters around 40°S. However, their spawning grounds are in tropical waters, south of Java. This is a unique species of tuna, in that one stock is distributed throughout the three major oceans, Pacific, Indian and Atlantic. For this reason, the description of southern bluefin tuna is not presented under each ocean but in a separate section. Figure 5.1 shows the total catch of southern bluefin tuna and catch by fishing gears. This species has been caught since the early 1950s, at first in tropical waters. Southern bluefin tuna have been subject of management by ICCAT since 1969, and by the CCSBT since its establishment in 1994. As the Atlantic Ocean covers only a very minor part of the distribution of southern bluefin tuna, and only Australia, Japan and New Zealand used to catch this species, in the 1980s ICCAT decided to leave the management of the species to trilateral agreements among these countries and now to the CCSBT. The major fishing countries have been only Australia and Japan. The Australian fishery has used several gears, including baitboats, purse seines, and trolling gear. The Japanese fishery uses only longlines. The catch of southern bluefin tuna was around 12 000 to 15 000 tonnes in the 1950s, and was used mostly for canning. When Japanese longliners adopted super-cold freezers and started fishing for the sashimi market, southern bluefin tuna acquired a high value in their market, as a substitute for (northern) bluefin tuna. 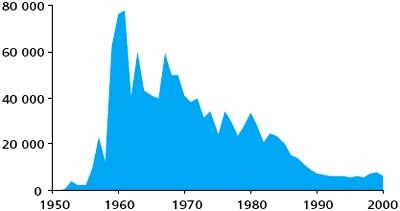 Consequently the catch increased suddenly to a peak of 80 000 tonnes in 1961, after which it gradually decreased to about 40 000 tonnes in the early 1980s, due mostly to a decline in the catch rate. In the early 1980s a quota system was introduced under a trilateral agreement among Australia, Japan and New Zealand. 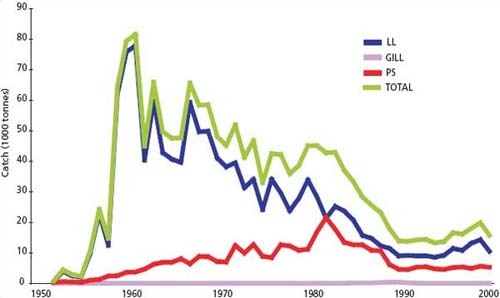 The annual quota has been reduced since then, as reflected by a sharp decline of the catch, and by the early 1990s had been reduced to less than 10 000 tonnes. The quota has been decided by the CCSBT since its establishment in 1994, and was kept at around 13 000 tonnes in the 1990s. The total catch started increasing again in the late 1990s due to the increase of catches by non-member fleets of CCSBT, i.e. the Republic of Korea, Taiwan Province of China and Indonesia. The gears used to harvest southern bluefin tuna have been either longlines or surface gears (mainly purse seines, baitboats and trolling, although drift gillnets were used in the 1980s, by Taiwan Province of China only). Surface gears are used only by Australia; all the other countries use longlines. Figure 5.2 shows the proportions of the catches made by each fishing gear. In the 1950s, almost 90 percent of the catches were made by longlines. However, the share by surface gears increased until the early 1980s as the Australian fisheries developed. 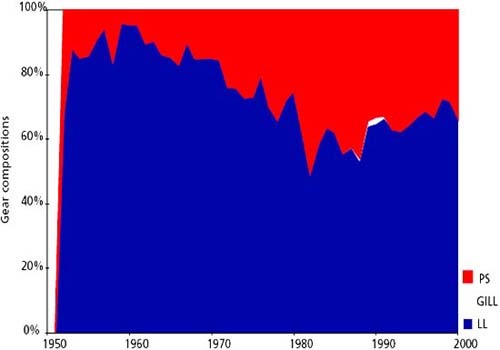 From the early 1980s, when quota regulations started, these proportions remained stable until the 1990s. The longline share started to increase further when non-member fleets of CCSBT started fishing with longlines, which were made outside of the quota. 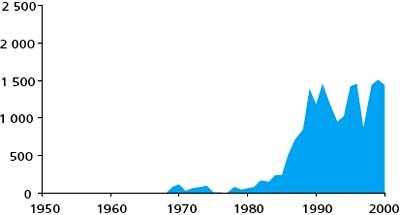 Longline catches of southern bluefin tuna increased with the development of the Japanese fishery, to the peak of 78 000 tonnes in 1961. After that they gradually decreased to around 9 000 tonnes in the early 1990s, but increased again to 14 000 tonnes in 1999 due to the catches by the Republic of Korea, Taiwan Province of China and Indonesia. Taiwan Province of China operated a drift gillnet fishery in the southern hemisphere, mainly in the Tasman Sea and the South Pacific, from 1982 to 1992. The main target species was albacore, but southern bluefin tuna were a secondary target. Catches were between 10 tonnes and 300 tonnes. The fishery ceased in 1992 with the 1991 UN ban on large pelagic driftnets. Australia is the only country catching southern bluefin with gears other than longlines or gillnets. These surface fisheries have used several gears, including baitboats, purse seines and trolling gear. 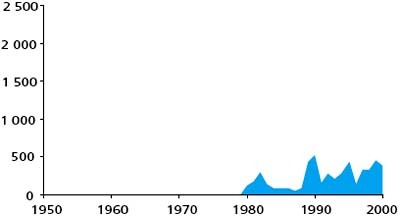 The major fishery catching southern bluefin tuna changed historically: in the early period, until the 1980s, baitboats were the major gear, but they were replaced by purse seines in the 1980s. 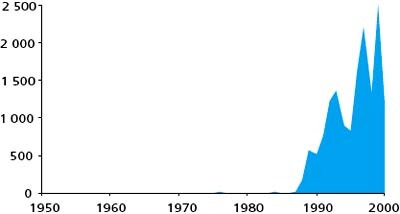 The surface catch increased as the fishery developed, and peaked at over 20 000 tonnes in 1982. Thereafter the catch showed a decline, due to the shrinking quota regulations. Figure 5.3 shows the world catches of southern bluefin tuna by country. As the magnitudes of the catch are so different among the countries, three different scales are used, one for Japan, one for Australia and the other for all other countries; this is different to all the other species and stocks in this report. Japan and Australia have been the two major countries fishing for southern bluefin tuna. 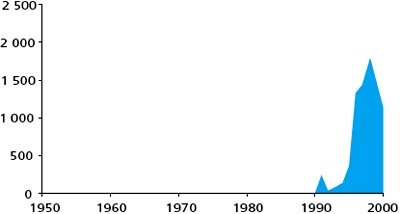 Japan started its longline fishery in the early 1950s; the catch increased rapidly to 78 000 tonnes in 1961, and then gradually decreased to around 30 000 tonnes in the late 1970s. It decreased continuously in the 1990s to around 6 000 tonnes due to the quota agreed by the trilateral agreements and the CCSBT. Australia has been catching southern bluefin tuna with baitboat, purse-seine and troll fisheries. 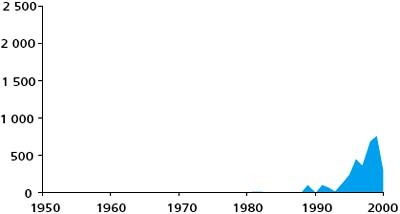 The fisheries started in the early 1950s, and the catch increased gradually to a peak of over 20 000 tonnes in 1982. It then decreased suddenly to a level of 6 000 tonnes in the 1990s, in line with the agreed quota, as stated above. All these gears catch relatively small juvenile tuna near coasts, and the catch used to be provided to the canning industry. However, because of the high price paid in the Japanese market for southern bluefin, some of the fish caught by these surface gears had also been exported to Japan, even though the price paid for small fish was far inferior to the large fish taken by longliners. In the late 1980s fish farming started: juvenile tunas are kept in cages and fattened for a few months before being shipped to the Japanese market. Since fish with high fat content, although small, fetch high prices, most of the fish caught by Australia are now fattened in the cages and exported. New Zealand started longline fishing in 1980. The catch increased to the peak of 529 tonnes in 1990, and has fluctuated between 150 and 500 tonnes in recent years. Taiwan Province of China started catching southern bluefin tuna in 1969 with longlines, and also operated a drift gillnet fishery in the southern hemisphere from 1982 to 1992. Their total catch increased in the 1980s to more than 1 400 tonnes, and stayed at a similar level in the 1990s. The drift gillnet catch was small, between 10 and 300 tonnes. 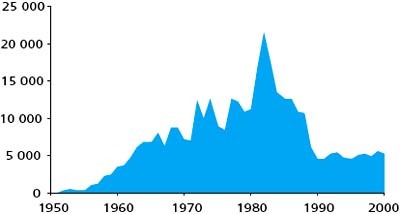 The Republic of Korea started a longline fishery for southern bluefin tuna in 1991, and catch increased rapidly to 1 600 tonnes in 1998, but then dropped to 987 tonnes in 2000. Indonesia started longline fishing for southern bluefin tuna in 1986; the catch has increased continuously to 2 500 tonnes in 1999.